Our sun is an unruly sphere of plasma, magnetism, fusion, and light. It frequently spurts million-degree plasma into the coldness of space in a display of epic uncouthness, but it takes a special disregard for manners to slurp that same plasma back down magnetic field lines to rejoin the surging sphere. That's exactly what happened to this stream of plasma on May 27, 2014: a tendril stretched into space, but never broke free. 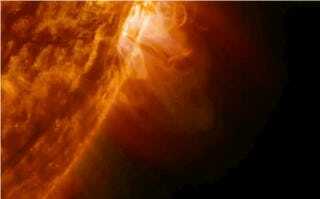 Instead, within two hours the plasma fell back into the sun, ionized atoms tracing out magnetic field lines. The video is a timelapse of just over two hours of observing time in two wavelengths of extreme ultraviolete light. All images credit: Solar Dynamics Observatory/NASA. You may also like this massive coronal arch, or a slower dance of plasma puffing.